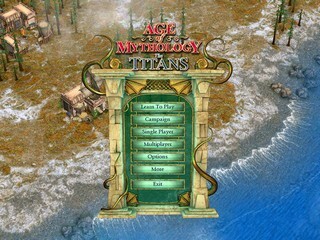 In Age of Mythology: The Titans, an expansion to the 2002 RTS, you take control of the Atlanteans as the new faction seeking a new homeland after the destruction of Atlantis. They lose their rapport with the Greeks upon being solicited to pick questionable new objects of worship. Then things go from bad to Norse. I mean Egyptian. Welcome to the expansion of Age of Mythology. This speedrun is recorded on easy as it provides additional resources and lowers the number of units you have to deal with. This expansion features 12 levels in a new "Titan" campaign, featuring Kastor instead of Arkantos as the main character. Kastor's abiltiy to instantly kill human soldiers is somewhat useful but not as good as his predecessor's. We do not have access to god powers in this mission as we are not following the Atlantean gods yet. So instead we have to rely on micromanagement and remembering our troop placement to win the day. It's a simple first mission, and a lot shorter than Fall of the Trident, so there's a plus! In this mission we must repair temples to the Titans while fighting off an aggressive Greek foe. Repairing a temple will grant you a behemoth which is a myth siege unit and is excellent at taking down town centres. It is unfortunate that I found this strategy, as I used to do the entirety of the mission quickly rather than cheese it in this way. Most of the effort involved in this mission is managing your building repairs and resource management with a little micro-management at the end to make sure units do not get caught up in the enemy's cluttered base. So this mission is meant to be about securing plenty vaults and eventually overwhelming your foes in a tide of units. Here we perform mission impossible by luring away the enemy army with a noble citizen and then ambush Melagius. You don't need to kill him to trigger the final cutscene, it will trigger at around 150 hitpoints, winning the mission. You get more than ten vortex powers in this mission, which makes it good for the "build up and kill" style you would use in casual play. Here we use the vortex power on cooldown to quickly jump from valley to valley de-constructing temples and warping in our own. We build some destroyers at the end as they are the tier 3 seige unit for Atlantis. They destroy (he he) the towers very quickly. This mission would be a lot more difficult if you were playing as Egypt, as their heroes move at a slow-ish pace. Given the Atlantean ability to make their fast cavalry into heroes you can attack all four bases in rapid succession, taking the enemy damage and stealing the relics from under Amanra's nose. Giving the player Earthquake and Tornado in this mission is a little bit of overkill honestly. An interesting mechanic for a mission. We get to have units that transform their type. The best being melee myth units that either have crush damage (cyclops) or multiple attacks (Hydras). We make a couple of detours to collect the bolt god power as it one-shots the heroes that stand before your myth unit army. This scenario has an instant-failure state which is the death of the son of osiris, as you are meant to use him to awaken the guardian. Given the strats used in this mission, you can see why I keep a close eye on him while sending the other priests to their deaths. You need to collect all the caravans so you have enough gold to produce priests. Simply put, you need to mass priests, micro-manage them around a bit to ensure they survive as long as possible and burn through the titan using the bonus damage that heroes do against titans. The gimmick for this mission is that Folstag the frost giant can freeze the Titan in place, cancelling its current attack and making it safe to attack for exactly half of Folstag's ability bar. We use our ulfsarks to create temples to produce Norse heroes as quickly as possible and trap the Titan in the second base when it hasn't been prompted to attack that base yet. At the beginning of the level, I place the fanatic ahead of my army so that the enemy uses "Traitor" on it rather than one of my frost giants. A word of warning: If you attempt this IL you will need to be patient with the initial stage of drawing out the titan. Sometimes he will ignore Folstag. Other times he will tell the entire army of huskarls to kill you instead. Sometimes he sends throwing axemen to attack you too early. Ymir the titan is a little tricky. This mission is a battle between keeping away from Prometheus, having the resources to build town centres and having the time to build and purify the area before Prometheus knocks it back down. When it comes to killing the titan, we use Heroic Murmillos as they are the staple unit of the line for Atlantis. They don't die very quickly and put out decent damage. Even still, killing the titan before ten minutes is very difficult. Traditionally, this mission is about fighting the automaton armies. Freeing three settlements then assaulting the summit with an army of heroes. We skip straight to stage 3 using the perfect set of god powers that the developers provide to us. Carnivora is a nice little power for providing line of sight without forcing me to lose a soldier, and it fights as the rearguard and de-aggros the starting automatons. Vortex allows us to skip over the gate, meaning we don't have to fight the initial automatons or the second wave from the citadel as they would block our movement. Valor give us heroic soldiers which don't trigger the spider lair god power and get instantly killed. Shockwave scatters and stuns all enemy units hit by it, allowing us to move more freely and attack without taking damage. After we get through the gate, all we have to do is get the three plot heroes into the passage to win the scenario. Sadly the last mission of the game is effectively an autoscroller with two bits of management on either end. We need our fastest hero to go to the furthest plant, and our other units to go to the other plants. The defences that the plants make are more than enough to kill any surrounding troops and then we go invade Kronos' front garden. Some cheeky micro-management keeps Kronos from ever attacking our army and then we use our horsemen to keep Kronos boxed outside of his base for as long as possible allowing Gaia to get free hits in. Once Kronos has been "slain" the cutscene begins.